There is no doubt that treatments with systemic insecticides can protect ash trees from the ravages of emerald ash borer (Agrilus planipennis) (EAB). 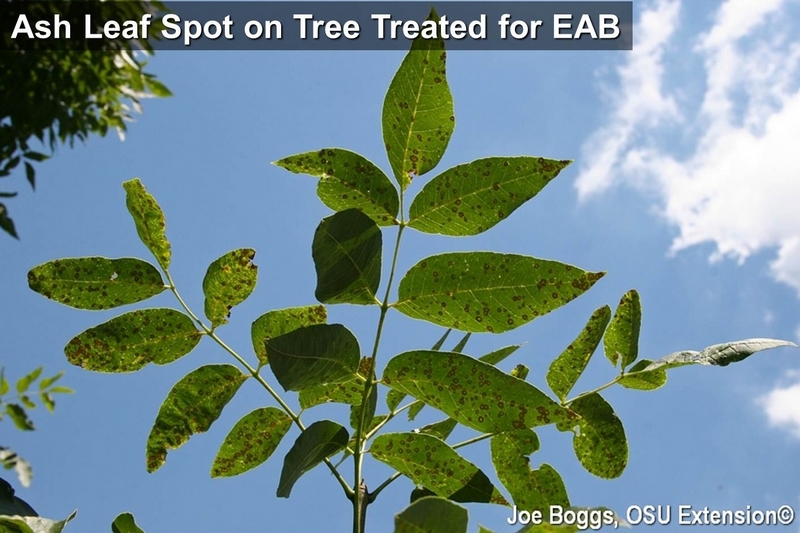 However, insecticide treatments against EAB will not produce super ash trees. Treated trees are still susceptible to a range of pest and disease problems that were observed on ash trees long before EAB arrived on the scene. This includes fungal leaf spots. Fungal leaf spots on ash may be caused by two different fungi: Mycosphaerella effigurata and M. fraxinicola. The diseases associated with these fungi are sometimes called Mycosphaerella leaf spot. Other names used in the past include "Piggotia leaf spot," and "Phyllosticta leaf spot." Leaf spots caused by M. effigurata appear as small, deep purple or yellow fleck-like spots on the upper leaf surface. Leaflets can become covered by hundreds of tiny spots making them look like they were splashed with specks of paint. Fruiting structures that eventually arise from the spots in late summer may give leaflets a sooty appearance. Leaf spots caused by M. fraxinicola are initially pale green, irregularly shaped, and much larger measuring as much a 1/2" in diameter. The spots my coalesce causing the entire leaflets to die. Severe infections by both fungi can cause premature defoliation. Unfortunately, there are no fungicidal control recommendations. The fungi overwinter in fallen leaves and disease development is favored by wet weather in the spring. Close proximity to the fungal inoculum from fallen leaves coupled with reduced air circulation causes leaves located lower in the canopy to become more heavily infected compared to leaves higher in the canopy. Consequently, disease severity may be reduced by raking and destroying fallen leaves, pruning to increase air circulation, and avoiding wetting the leaves with irrigation.